Submitted by Paul McConnell on Sun, 15 Mar 2015 - 12:28. When giving his consent to enclose Ealing Dean Common for use as allotments, the Bishop of London set a number of conditions. One of these was that no person be permitted to work on the Lord’s day on pain of forfeiture of their allotment. Each plot-holder signed a tenancy agreement by which they promised, amongst other things, not to work their land on a Sunday. It was reported to the allotment committee meeting on 22 April 1856, that many plotholders were in the habit of working their plots on Sunday mornings, thereby contravening both the Bishop’s condition and also the rules agreed to in their tenancy agreement. The committee decided to send notices to the tenants to inform them that anyone found on their plots after 9am on Sundays would be dispossessed. The minutes of 28th October 1858 show the issue had not gone away, with several complaints received. The rent collector, Mr Atlee, was asked to caution those breaking the rules. In November 1858, presumably after being cautioned, 50 plotholders sent a petition to the committee asking, very respectfully, if they could be allowed to work before eight o’clock on a Sunday morning, “we having our time occupied by our daily labour”. The committee must have hardened its attitude from April 1856, when it seemed to be acceptable to work up to 9am. 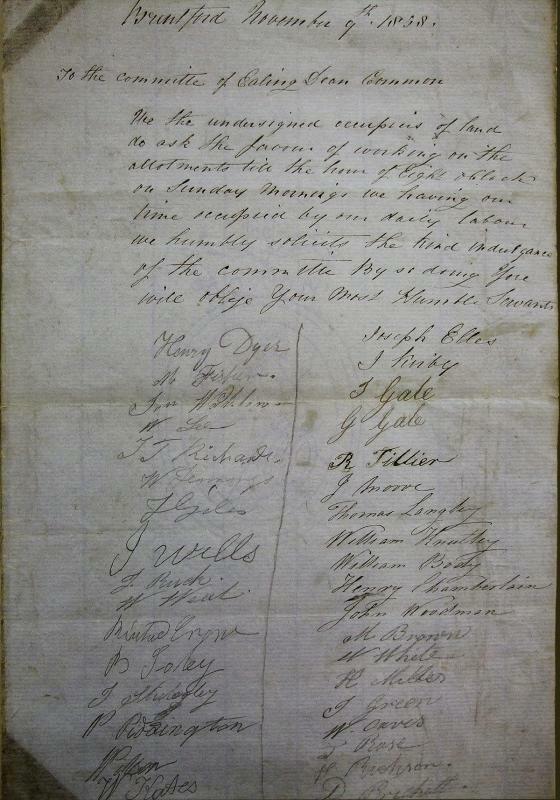 The original petition can be seen in the image below left (reproduced by courtesy of London Metropolitan Archives, City of London) with a transcript of the text on the right. The Committee considered the petition on 18th November, 1858 and they declared unanimously that Sunday working was a direct violation of the fundamental principle on which the Bishop of London had made the grant of land and that it could not in any way be allowed. Mr Atlee reported to the next meeting on 28 December, 1858, that he had served a notice on the tenants not to work on Sunday and he further reported on 28th April, 1859, that having made several Sunday visits, he had seen no-one working. The committee’s attitude seems very harsh today. It is easy to see the difficulty that working men would have in finding time to tend their plots which, at 20 poles, were twice the size of today’s full-size plots. We also know the occupations of the plotholders from a report to the same Committee meeting in April 1858: 91 labourers; nine carpenters; nine bricklayers; five shoemakers; two cow-keepers; two widows; and one each of ten miscellaneous occupations such as painter, blacksmith etc. Only the two widows were in receipt of parochial relief and the rest were working labourers and tradesmen, hardly members of the leisured classes. The Chairman of the committee was the vicar of Ealing and the committee would no doubt have felt genuinely, that their hands were tied by the conditions set by the Bishop. Ironically, however, it emerged later that this and other conditions set by the Bishop were not enforceable under the law. Of course Sunday is now a very popular day for tenants to work on their allotments and it is no longer referred to in the tenancy agreement, but we do not know when this condition was relaxed.